Looking for that perfect gift? 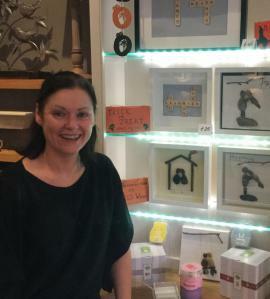 Welcome to Crafty Gifts and Frames, Shinrone, Co. Offaly - you can find it here. 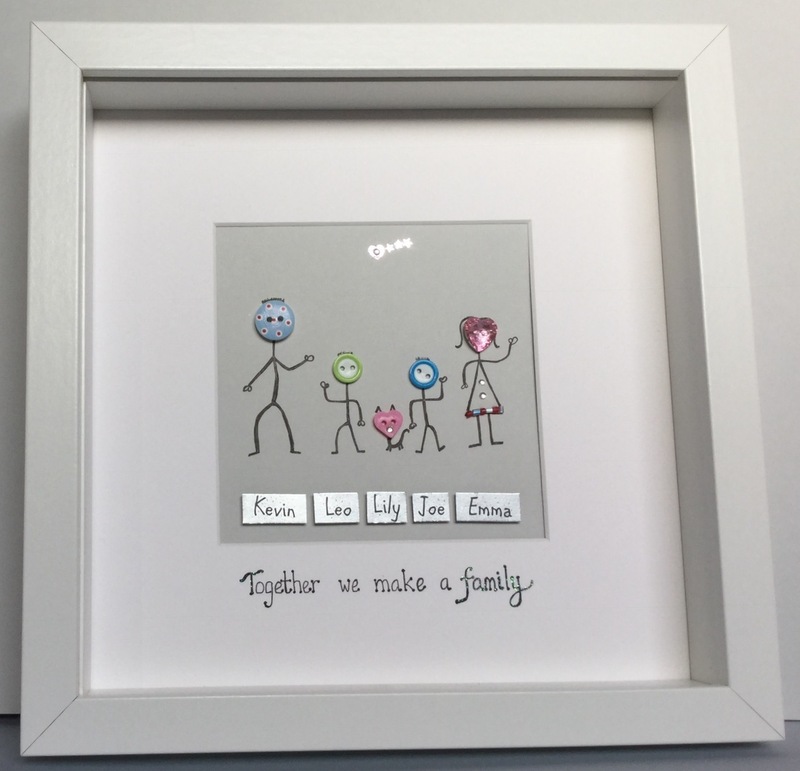 You will find beautiful, hand-crafted gifts and frames, from colourful family name plaques to beautiful engagement, wedding gift frames and family trees. Whatever you are looking for, I can help you find the perfect gift for every special occasion, birthday and every seasonal holiday. There are lots of choices when it comes to picking gifts for your family and friends but I think if you choose a hand-made gift they will be extra super happy! 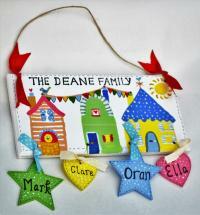 My name is Clare Deane and I love creating beautiful things. I pride myself on my attention to detail to make the perfect gift, tailored to your specific needs. I invite you to look through my website for ideas and inspiration and then contact me to discuss your wish list and any queries or specific items you would like included to make it that little bit more personal and exclusive. I hope you like my work and please check again soon to see even more new gifts. They take a little longer but are worth the wait. Thank you in advance for your patience :-) All gifts can be customised to your own specifications to make it an extra special gift. People who I have given these type of gifts to have felt they are so personal and are really touched by the thought put into it. 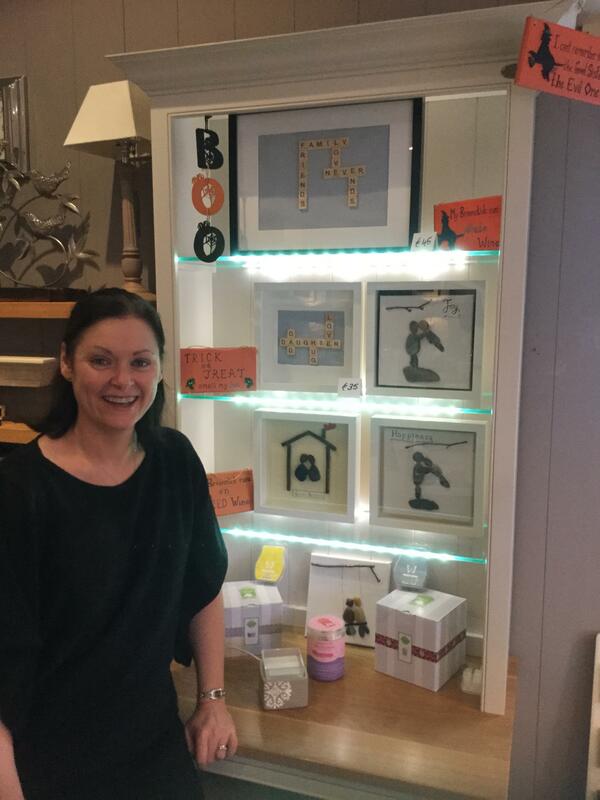 Crafty Gifts and Frames operates to ensure the highest standard of customer service is met. If you have any questions, don't hesitate to contact Clare on: 086 4002030. Buying couldn't be easier! Just browse the Shop and click on the product you wish to buy, and add it to your shopping basket. View your basket at any time by clicking the link in the top right hand corner. When you are ready to buy click on "Checkout" and you'll be directed to the securely encrypted checkout page. Simply enter your details in 3 easy steps and you're done! Payment is through Stripe which means we do not hold your credit card details at any time and all transactions are completely secure. I also accept cheques. 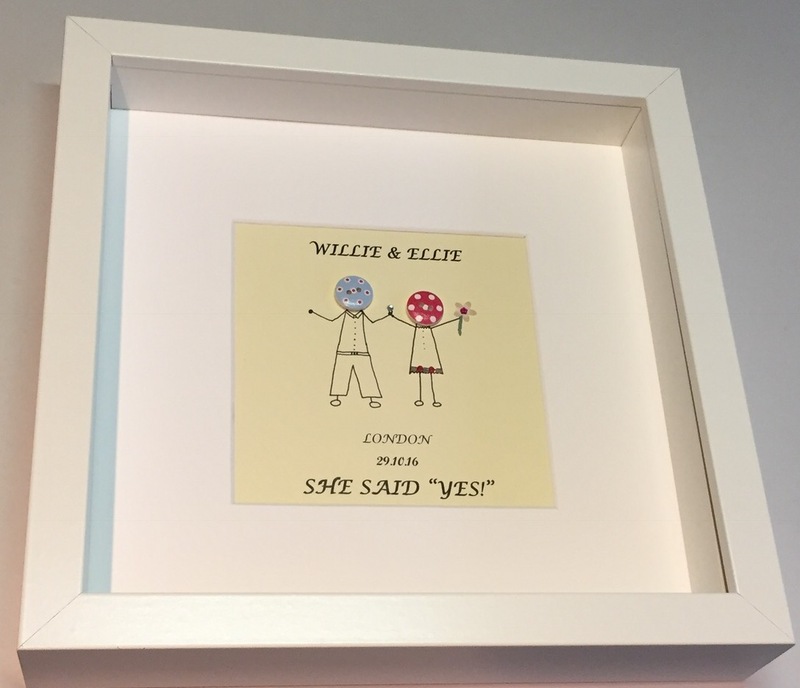 What a fabulous gift this personalised Pebble Art Wedding Day Canvas will make for the happy couple celebrating their Wedding Day. 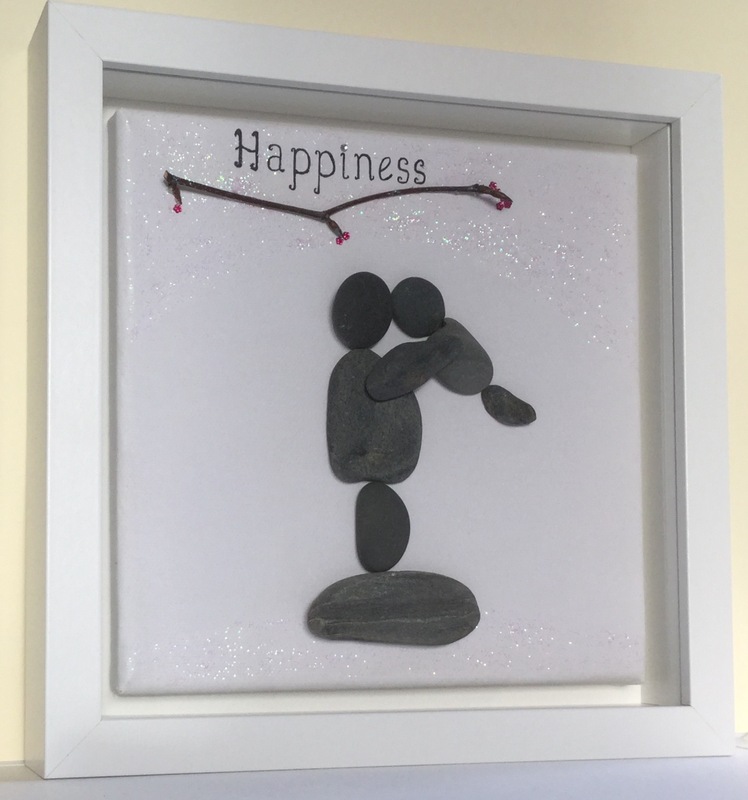 This unique hand-made canvas will add a touch of class and originality to the happy couple's home, bringing back memories of their happy day every time they look at it. Personalised with any short words, date or the happy couples names, it will be like no other gift they receive. It will make a fantastic keepsake and is sure to be given pride of place. They will be reminded of you and your thoughtful gift each time they pass your crafty gift. FREE gift card included to add a message of your choice to make this gift extra special. 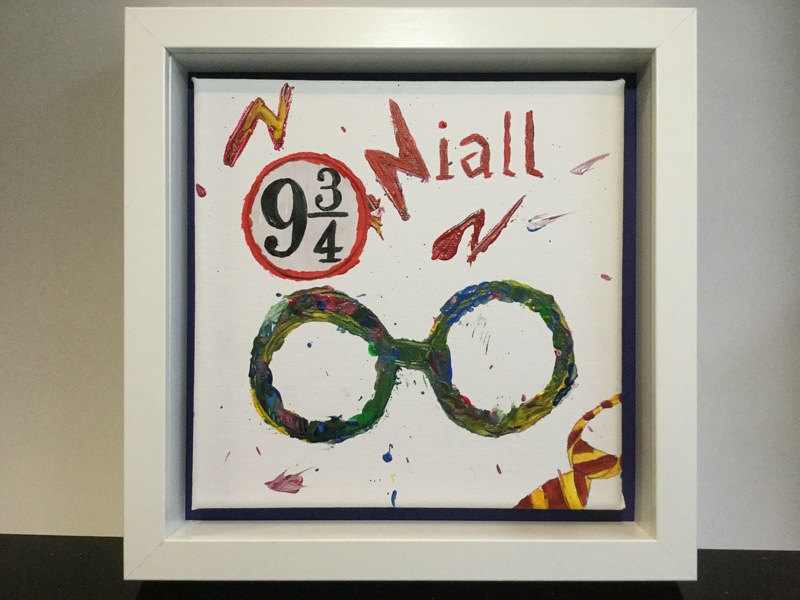 This Framed Canvas is a must for all young Harry Potter fans. As all Harry Potter fans will realise the canvas depicts Harry's glasses, the legendary station platform number and his school tie. It can be personalised with any name, comment, date etc to make it extra special. 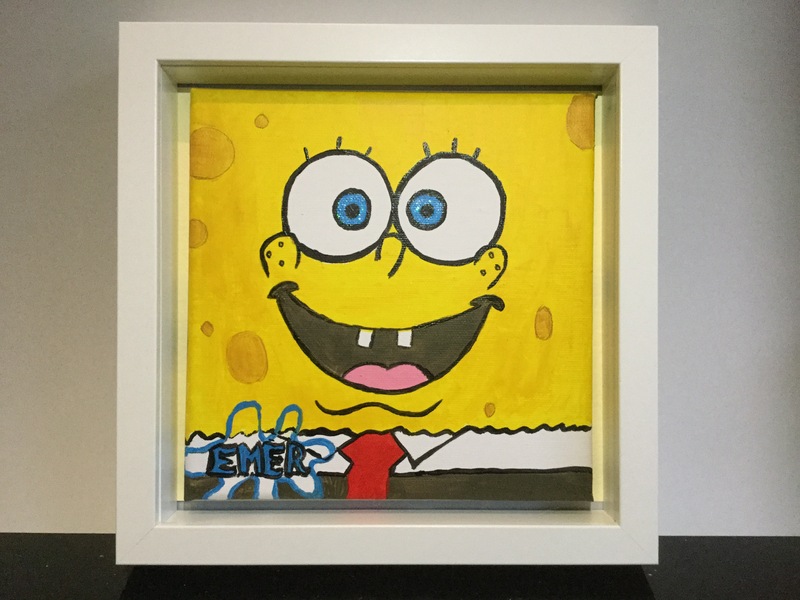 We can make gifts for any occasion or event depicting virtually any picture, for example I had a request for a young Spongebob Squarepants lover, which I personalised of course! You can chose any words, dates or phrases that you wish to personalise this gift. 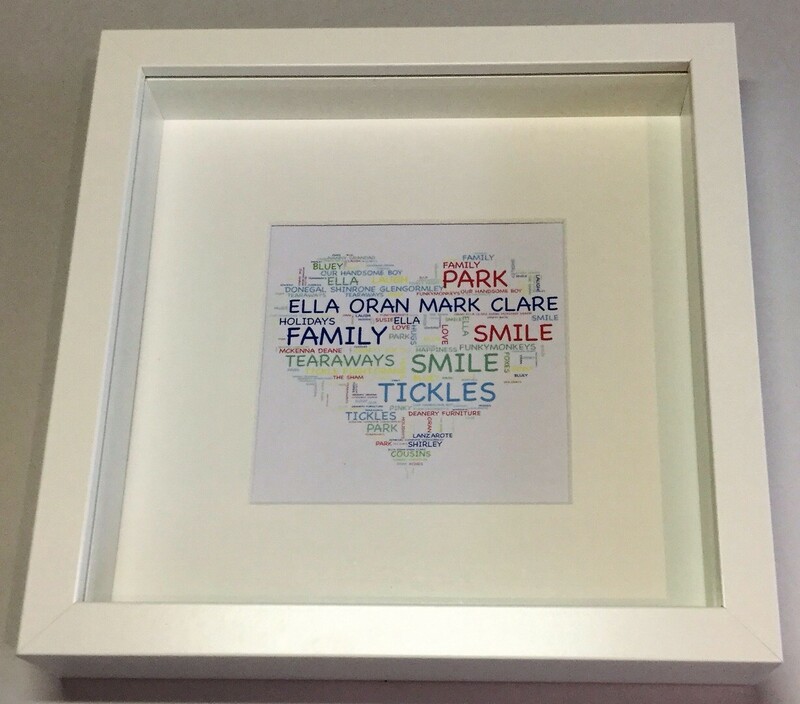 This medium sized handmade scrabble frame was requested by a customer as a Christmas present from her kids to their aunty but this would make a perfect gift for any occasion, for example as a present for an engagement, wedding, birthday, anniversary, new baby or family present. 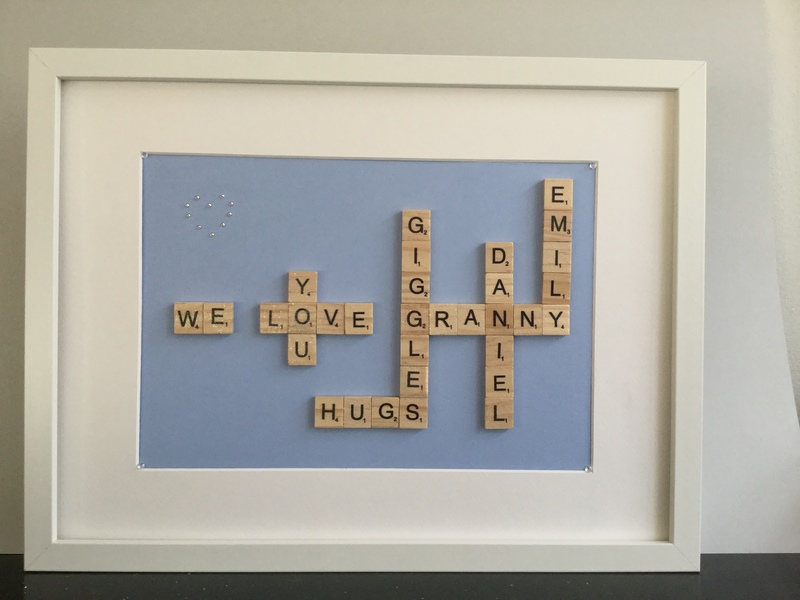 As you can see the scrabble frame can be customised with any names, special words, places or any important events that you wish as they are made to order especially for you. Please message me to let me know your chosen names, words etc. 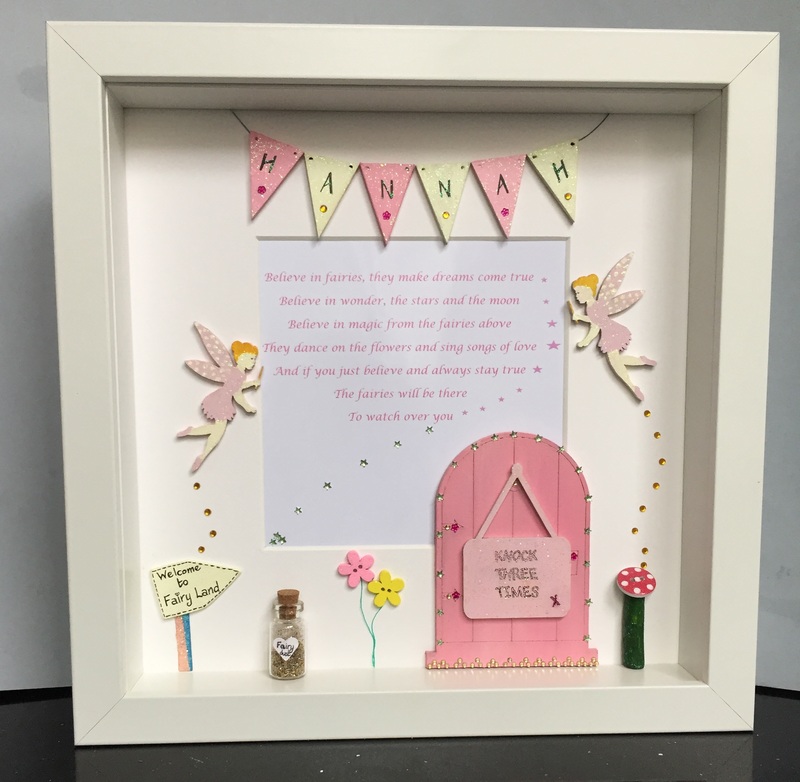 The frame also includes a glittery heart with tiny rhinestones and some white crystals to add a little bit of sparkle to it all. 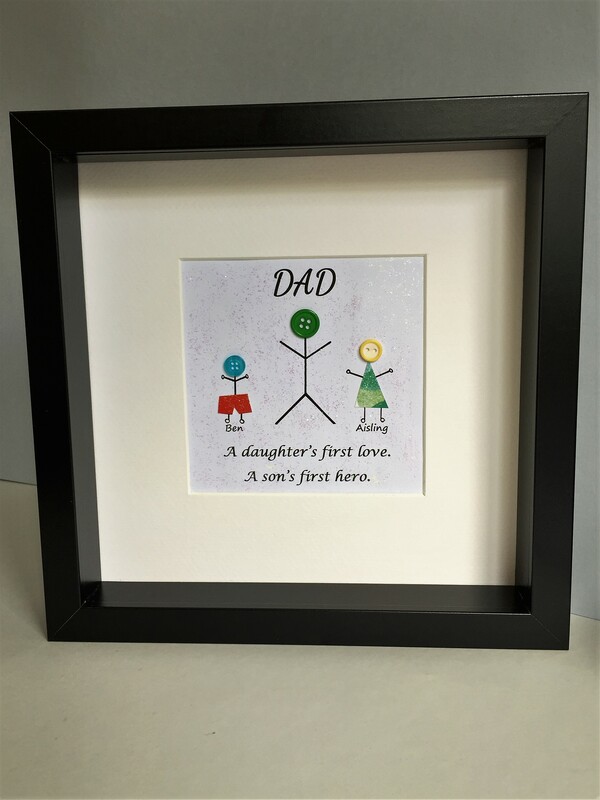 You can chose between 2 frame colours, white and black and a variety of card colour or embellishments. 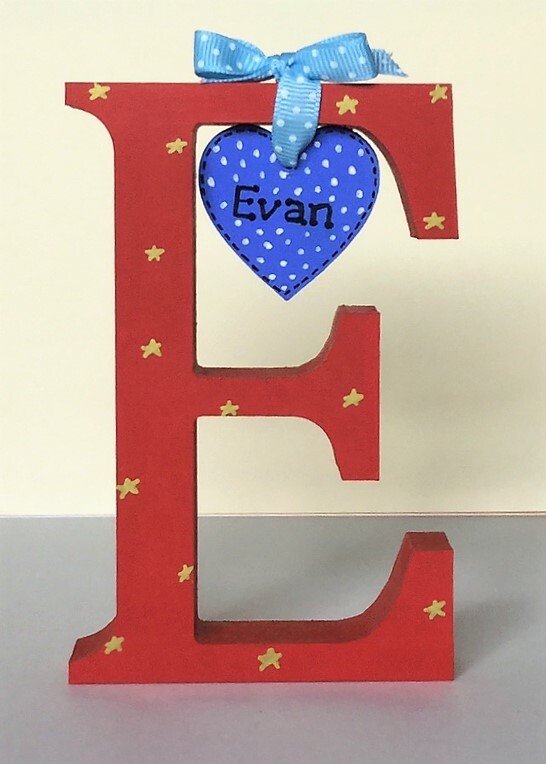 I usually have a large stock of tiles, however, I will let you know if I need to order any in if your names / words contain very popular letters. These are made to order so please allow up to 5 working days to create these before postage. Free gift card included to write your own personal greeting. 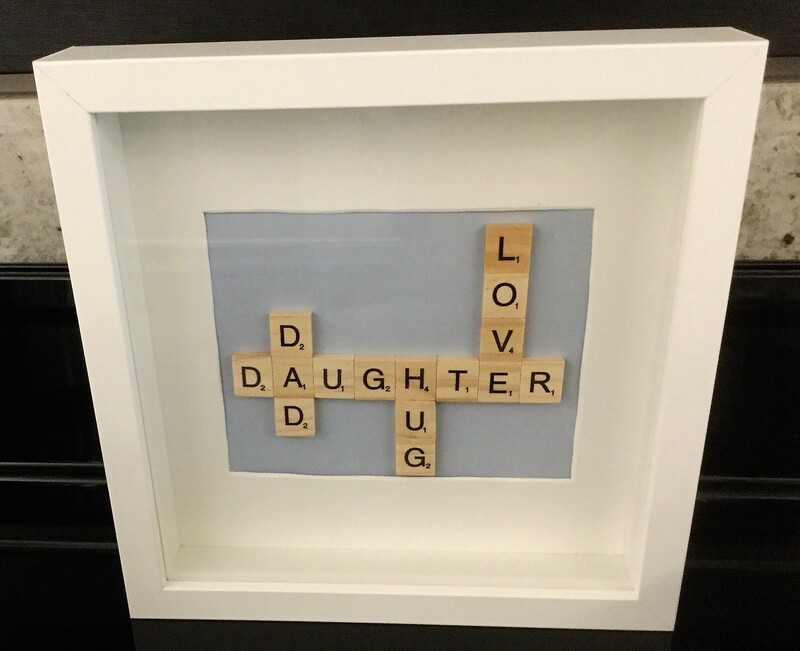 This medium handmade scrabble frame was requested by a customer as a Christmas present from her kids to their granny but this would make a perfect gift for any occasion, for example as a present for an engagement, wedding, birthday, anniversary, new baby or family present. 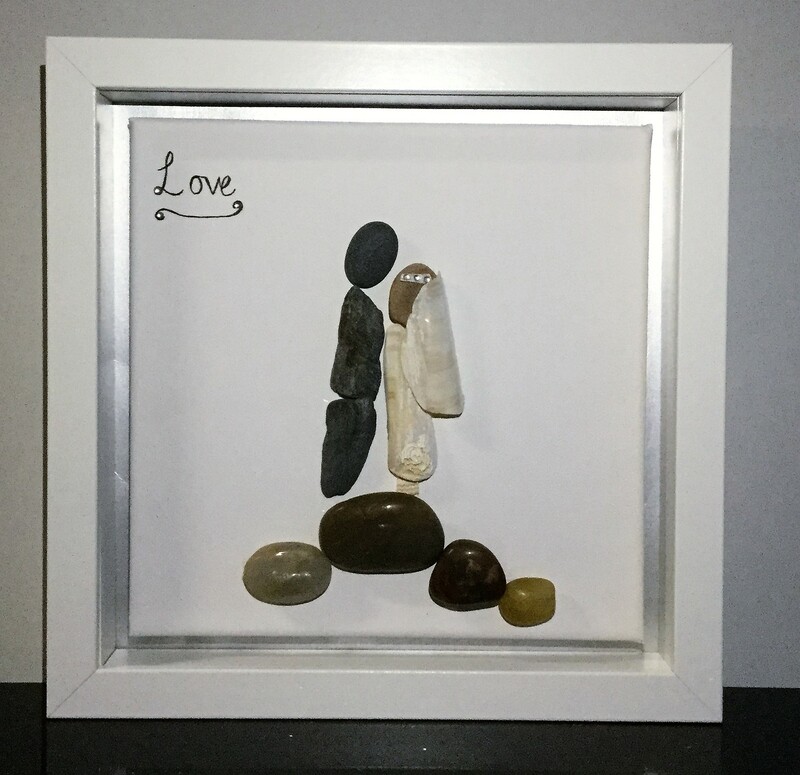 What a fabulous personal gift this Pebble Art Canvas - The Lighthouse will make for any special person in your life. It will make a great gift for any occasion, especially if they like the sea, lighthouses or holidays. It can be personalised with any short words or phrases, date or couples names, it will be like no other gift they receive. It will make a fantastic keepsake and is sure to be given pride of place. They will be reminded of you and your thoughtful gift each time they pass your crafty gift. Buying couldn't be easier! Just browse the Shop and click on the product you wish to buy, and add it to your shopping basket. View your basket at any time by clicking the link in the top right hand corner. When you are ready to buy click on "Checkout" and you'll be directed to the securely encrypted checkout page. Simply enter your details in 3 easy steps and you're done! What a fabulous gift this personalised Pebble Art Wedding Day Canvas will make for the happy couple celebrating their Wedding Day. Personalised with any short words, date or the happy couples names, it will be like no other gift they receive. It will make a fantastic keepsake and is sure to be given pride of place. They will be reminded of you and your thoughtful gift each time they pass your crafty gift. string(82) "images/sobipro/entries/841/five/Love Wedding Gift for the Married Couple Frame.jpg"
This Framed Canvas is a must for all young Harry Potter fans. As all Harry Potter fans will realise the canvas depicts Harry's glasses, the legendary station platform number and his school tie. 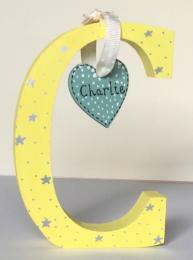 It can be personalised with any name, comment, date etc to make it extra special. string(59) "images/sobipro/entries/841/six/Niall Harry Potter Frame.jpg"
We can make gifts for any occasion or event depicting virtually any picture, for example I had a request for a young Spongebob Squarepants lover, which I personalised of course! You can chose any words, dates or phrases that you wish to personalise this gift. 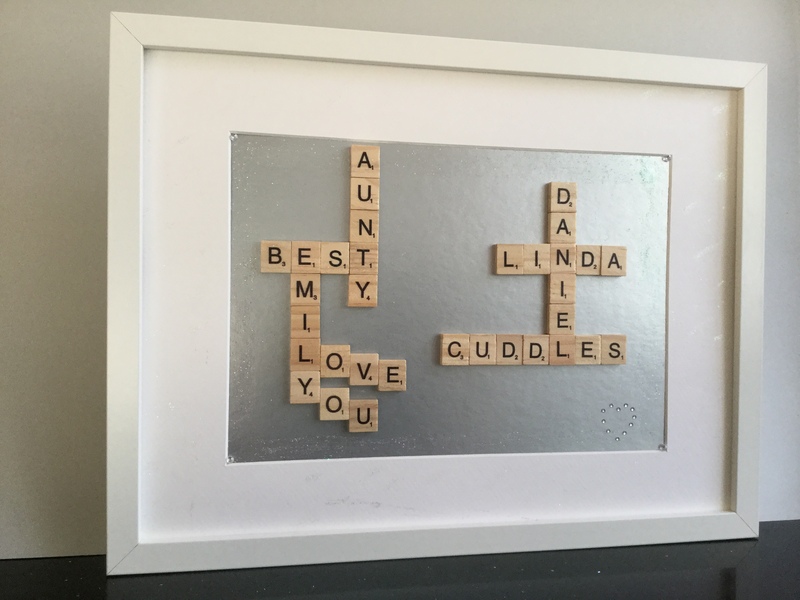 As you can see the scrabble frame can be customised with any names, special words, places or any important events that you wish as they are made to order especially for you. Please message me to let me know your chosen names, words etc. string(71) "images/sobipro/entries/841/eight/Aunty Linda Scrabble Letters Frame.jpg"
string(77) "images/sobipro/entries/841/nine/We love you Granny Scrabble Letters Frame.jpg"
What a fabulous personal gift this Pebble Art Canvas - The Lighthouse will make for any special person in your life. It can be personalised with any short words or phrases, date or couples names, it will be like no other gift they receive. It will make a fantastic keepsake and is sure to be given pride of place. They will be reminded of you and your thoughtful gift each time they pass your crafty gift. 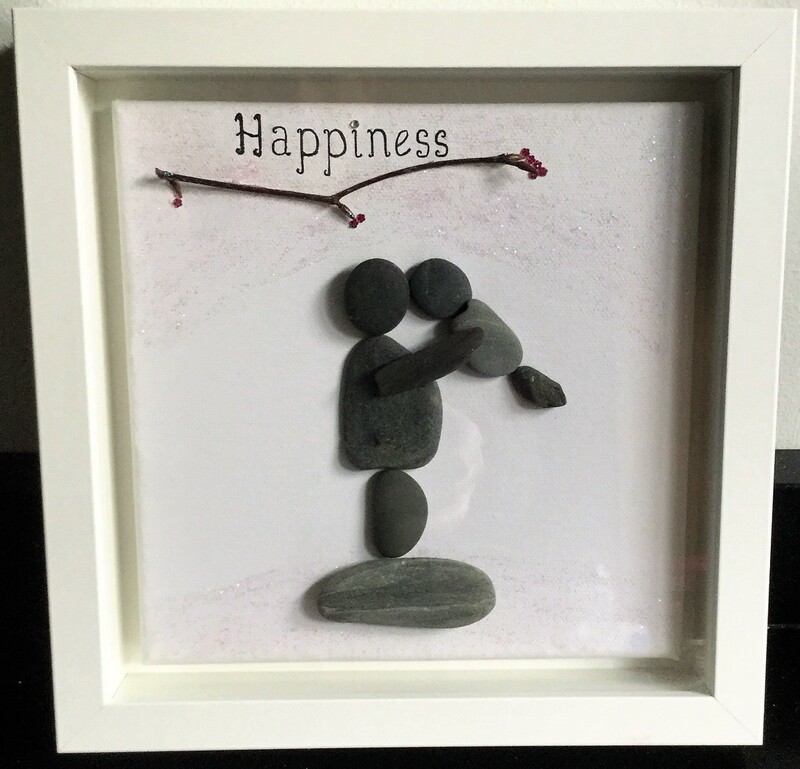 string(70) "images/sobipro/entries/841/ten/Lighthouse Pebble Art Framed Canvas.jpg"
string(87) "images/sobipro/entries/841/galone/Happiness Pregnant Mother and Baby Framed Picture.jpg"
string(28) "Pebble Art Framed: Happiness"
string(84) "images/sobipro/entries/841/galtwo/Love Wedding Gift for the Married Couple Frame.jpg"
string(38) "Pebble Art Framed: Love Wedding Canvas"
string(30) "Button People: She said "Yes!"" 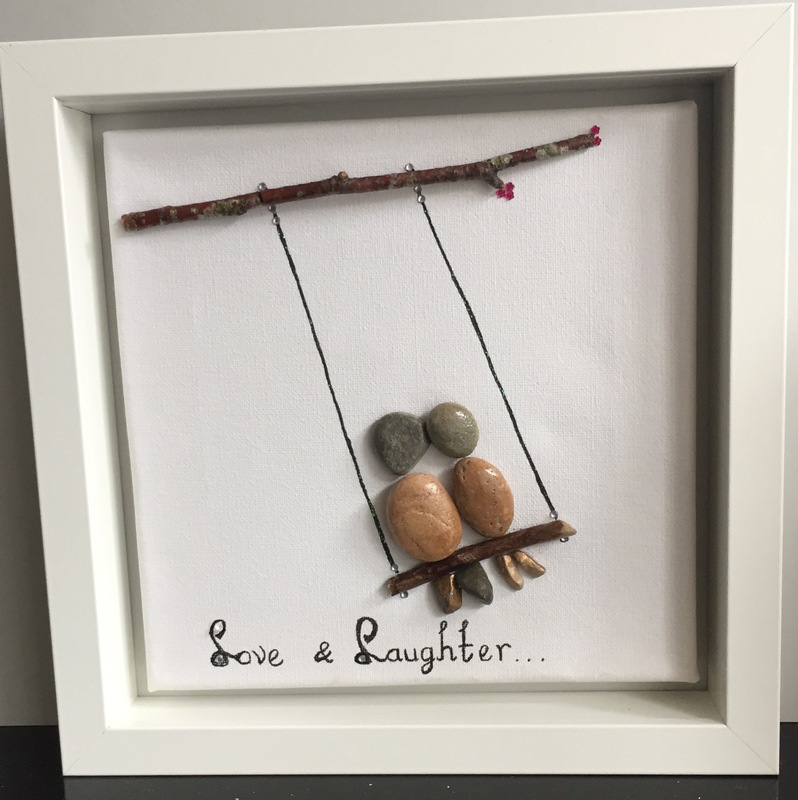 string(44) "Pebble Art Unframed: Laugh Couple on a Swing"
string(26) "Pebble Art Frame: New Home"
string(92) "images/sobipro/entries/841/galseven/Dad Daugher Love Hug Scrabble Letters Framed Picture.jpg"
string(38) "Scrabble Letters Frame: Dad & Daughter"
string(87) "images/sobipro/entries/841/galeight/Dad a daughter's first love with normal clothes.jpg"
string(57) "Dad - A daughter's first love. A son's first hero. Framed"
string(73) "images/sobipro/entries/841/galnine/Aunty Linda Scrabble Letters Frame.jpg"
string(35) "Scrabble Letters Frame - Best Aunty"